In the past thirty years, knowledge on flooding has greatly increased by moving away from purely hydrological and hydraulic science and opening up to other disciplines such as economics or human and geographical sciences. It is as part of this multidisciplinary approach that this book proposes a review of current knowledge on flood risk. It starts with the ever-increasing impact of flooding in order to conceptualize and understand the constituents of risk. Although risk knowledge in modeling methods or naturalist approaches remains essential, it is further developed by the fields of economics, human sciences, geography, environmental psychology and history. This integrated approach to flood risk contextualizes current conclusions on the eventual effects of climate change by showing that human factors are of paramount importance in understanding the process of “risk production”. The book sets a state of art around the "flood issue" from the description of the phenomena to the management of risk (dikes, dams, reducing vulnerability, management of crisis…). The chapters are written by specialists but are accessible to the "mainstream scientist". 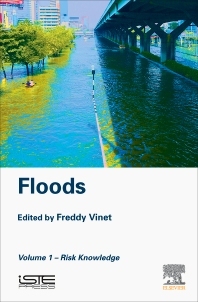 Each chapter exposes knowledge, methodologies, scientific locks and the prospects of each discipline on the theme of floods. Freddy Vinet is Professor of Geography at Paul Valéry University in Montpellier, France and co-director of the Gestion des catastrophes et des risques naturels Masters course. His research focuses on the vulnerability of populations faced with flooding and the evaluation of prevention measures.